These Boots are made for rocking. After his success as a supporting player in the Shrek films, the sly cat of cats Puss In Boots gets his own self-titled starring feature and the results are so funny and irresistible audiences are bound to be swept away into this kitty's universe. 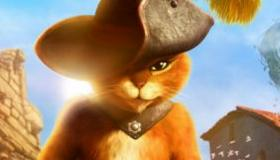 Smartly creating a origin story for the Antonio Banderas-voiced character, this animated romp follows the swashbuckling cat and the vivacious Kitty Softpaws (Salma Hayek) on a perilous search for Jack and Jill's "magic beans." Kids and their parents should be with the hilarious adventure every step of the way, earning a lot of loot for DreamWorks Animation at the box office and on other platforms. Don't expect Shrek-sized business, but this charmer will score big in the robust fall family market, just like that other cat, Disney's Lion King 3D, did recently with its wildly successful re-release. Taking place long before he hooked up with Shrek, we're introduced to this kitty at an orphanage in San Ricardo where he and fellow orphan Humpty Alexander Dumpty (Zach Galifianakis) dream of finding some magic beans to grow into a beanstalk that stretches into a giant's castle in the clouds where they hope to sneak in and steal a goose that lays golden eggs. But the dream quickly dies, the youths drift apart, and Puss' notorious reputation begins after he rescues a woman from a charging bull. Puss and Humpty's divergent paths trigger their darker sides with Puss becoming a near-mythic outlaw and lover. But Humpty still nurses a plan to steal those magic beans, and Puss and new acquaintance Kitty Softpaws, a feline with no claws, but plenty of brains join in the search, only to be thwarted by the evil Jack (Billy Bob Thornton) and Jill (Amy Sedaris) who also have plans for the legendary legumes. While the plot is certainly workable, it's the engaging characters that really make this purr. Banderas, as he proved in recent Shrek editions, is born to play this role, infusing Puss with just the right amount of Latin swagger and style. He's confident enough to send up his own past roles as Zorro and Robert Rodriguez's Desperado. Whether sipping up a shot of milk in a bar, doing a wild tango or brandishing his ever-present sword, this is one killer kitty. As his streetwise lady love, Hayek is perfectly matched while Galifianakis brings just the right touch of confidence and vulnerability to the hapless Humpty. The Jack and Jill duo skews too dark and is villainously under-utilized, but Thornton and Sedaris give them an Wild West wickedness in their limited screen time. Another cat serves as a kind of Greek chorus with his shocked reactions to the action and intrigue. Computer-animated 3D action is superbly rendered with a nod to Sergio Leone westerns like The Good, The Bad and The Ugly, something to make adults and film geeks smile. Yes indeed, even in 3D, this cool cat is every inch the star. Take that, Shrek. Cast: Antonio Banderas, Salma Hayek, Zach Galifianakis, Billy Bob Thornton, Amy Sedaris.